The most striking thing about Prisoners is that almost everyone can be considered a bad person. In the film, where the two young daughters of Dover and Grace Keller (Hugh Jackman and Maria Bello) and their neighbours, Franklin and Nancy Birch (Te rrence Howard and Viola Davis) go missing, there is no shortage of suspects. However, it is also the parents whose moral worth can also be questioned. There is a line of uncertainty surrounding the actions of the victims’ families that runs throughout the film. One that leaves you wondering just how vindictive a person can be in the pursuit of justice. The two girls go missing on one dreary Thanksgiving afternoon after a get together between the two families. With not a lot to go by, the families’ suspect that the owner of a dirty RV parked nearby must be responsible. In enters Detective Loki (Jake Gyllenhall) and the RV owner, Alex Jones (Paul Dano). Not much is known about the two characters, but Detective Loki could be the blandest character ever put to paper. What makes Gyllenhall’s performance so special is the intensity he puts into the role which really brings him to life. His dedication to finding the girls is unrelenting, even dipping into police brutality when he does not get the answers he needs. Not a lot is known about Loki’s past, but what is revealed is that he spent time in a boys’ home. Through this, it is implied that he suffered from abuse as a child. Alex Jones on the other hand, is a mysterious, strange and compelling character. He speaks in a high-pitched tone that is haunting yet endearing. It seems like the mentally-challenged Alex is stuck in a perpetual childlike state. All the while, he seems confused and scared by the controversy surrounding him. After being arrested, Alex is subsequently let go due to no evidence being put against him. Keller cannot accept this and is so thoroughly convinced of his guilt, that he kidnaps and tortures Jones. What follows are some very morbid and troubling scenes, making the gore from films like Saw seem tame. Keller enlists the help of the Birchs but they want nothing to do with it, neither stopping nor helping Keller with his actions. Even though the Birchs have doubtσ, they do not attempt to stop Keller continuing his depravity. Through the actions of Keller and the Birchs, Jones becomes a very sympathetic character. You begin to feel semblance with the Birchs. Doubting Jones’ guilt but feeling like the torture is in some way necessary. Just in case of the ‘what if?’ factor. Jackman delivers the performance of his career. The Survivalist Keller’s basement is filled with gas masks, bags of lime and plenty of tinned food. He has enough supplies to survive a nuclear winter. However, despite being prepared for anything, he is in no way equipped to deal with his daughter’s disappearance. The God-fearing Keller meekly utters prayers before each torture session of Jones. With each time, his moral values are slowly starting to slip beyond the point of redemption. His descent into darkness is well chronicled by Jackman, and as aforementioned, your sympathetic allegiances start to slowly shift towards Jones. The lines between good and bad become blurred, making it very hard to know just what to believe. When it comes to a film with a plot so intricate and with so many twists, it is important not to give too much away. It is worth saying though, that the film takes you on a two-hour and-a-half journey of doubt, suspense with plenty of wrong turns along the way. What you think is right, is wrong and with each turn, Director Denis Villenevue wracks up the tension one extra knot. The other elements that make up this film are excellent also. Roger Deakins, the regular Cinematographer for the Coen brothers provides fascinating shots throughout. His use of extensive close-ups to show the fear, uncertainty and horror in the facial expressions of the family members as their worlds fall apart. Deakins’ also applies this treatment to each suspect. Catching each of their nervous twitches and ticks, it is clear that this is a story where no one is safe from scrutiny. Alongside this, the perpetual rainy streets of rural-town Pennsylvania that are devoid of colour and drabbed in rainfall represent the tunnel of despair both families are falling further into. Whilst the final payoff may n ot be the climax that a film with so many plot-twists beautifully woven into its narrative deserves, it does still feel satisfying. What could have otherwise been a cheap, run-of-the-mill TV thriller is executed with infallible acting, excellent cinematography and edge-of-your-seat storytelling. 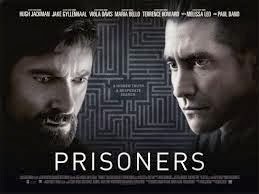 Prisoners can often be uncomfortable viewing and is packed with questionable characters, each of which is filled with moral ambiguity. Its dark style and harrowing theme puts it on par with films such as Zodiac and Mystic River, which makes this a must see for fans of the Crime/Thriller genre.